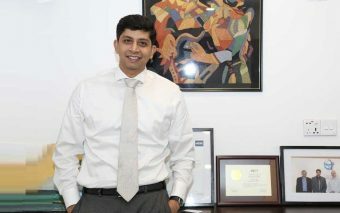 For those who don’t know Rabeth Khan, he is the Chief Executive Officer of MACOMM/Dentsu and MediaAxis/Carat, two of the successful and fast growing advertising and communication services companies based in Dhaka. From a modest beginning of a 3 person agency, over the past years, he and his team have built an entire group of mission-driven communication companies – having businesses in media buying, creative, music and experiential marketing and digital marketing – from scratch, which continues to experience tremendous growth while staying true to its core values of conducting ethical business. And Mr. Rabeth is just getting started. Mr. Rabeth, in his early 40s, is an extremely driven-person. As you go through the interview you will see that his journey is a story of being relentlessly resourceful – exactly what you look for in an ideal founder. And he is a deep thinker and takes a deep interest in learning and is a voracious reader. Building a consequential business is a lot of thinking job. Conventional wisdom would not take you far. You have to see things beyond the surface and understand that most things are not what they appear to be. These are not easy jobs. On the other hand, the story of Mr. Rabeth and his companies answers many pressing questions related to entrepreneurship including how to be relentlessly resourceful, build a great team and company culture, how to persist in the face of obstacle and challenges and so on. This was a much longer interview, so we had to break it up into three parts. This is the second part of the interview, you can find part one of the interview here. Please come back later this month for the final installment of the interview. Happy reading ? Could you please give us an overview of the company? You have 4 companies and a team of about 70 people, business-wise how many clients do you handle on a monthly basis as well as how do you operate as an organization and your organizational culture? As you said, we are a team of around 70 people now. At this moment, there are about 25 clients that we are serving under MACOMM and MediaAxis put together. If you are talking about organizational culture, I have always believed that if you want to be a true leader, you also need to be a good worker. I’m not cut out to be a golf-playing CEO, I’m a worker CEO. I’m a ‘get your hands dirty’ kind of CEO. In every manner possible, our company is open. The junior most executive can walk into my room anytime. It is a flat organization structure. Of course, we have positions and hierarchies, but these are not how the organization is run. These are titles that are important for operational reasons. Other than that, everything is pretty much horizontal in nature. I always work alongside my people. I will continue doing that as long as I’m here. I’m actively involved in day to day operation. I get to every communication with our clients. I try to contribute to anything that is critical. So, open culture is one, ethical practice is two. Number three is we never allow class hierarchy at the organization. Everyone is treated equally and receive equal respect. Currently, 20% of our employees are women, and the number is increasing rapidly. What are the services you are offering from MACOMM/Dentsu and MediaAxis/Carat? MACOMM/Dentsu works for creative, brand management, and brand events. These are the three main services that we do under MACOMM. MediaAxis/Carat specializes in media planning and buying across all ATL platforms. D’reach is all digital. Creinse is into experiential, music, content and events. We are working on a fifth company. We named it Nagamorich. It is going to be our events and activation company. You had your share of ups and downs. In fact, I could pick a few from the story that you told me. What are the major challenges you’ve faced, if you could give us an insight into that? I became an entrepreneur because I needed to support my family rather than I wanted to be an entrepreneur. My first struggle was a family struggle, of which I already spoke about. That I had to fight. I had to make it happen anyway. And the reason I succeeded in some of those tiny entrepreneurial initiatives because I knew my strength and weaknesses very clearly. Every new entrepreneur should know his strengths and weaknesses. You can’t do it all. You have to choose accordingly. I worked on my strength and developed my strength to help me to go through those initial difficult days. The second challenge, which I told you at the very beginning of the story, I had no guide, no mentor. At that time there were not many entrepreneurs in our line of work. In my family, there were engineers and doctors but no entrepreneur who would understand my part of the world. This was another big challenge. I was lucky that my understanding of business paid off. In many instances, I went by my gut feeling, my own belief and I hoped for the best. And in many cases, it clicked. I think this is where there needs to be more work done in the context of Bangladesh, helping young people with guidance and mentorship. I appreciate what Brand Forum has been doing but I think there still is not any proper support system for these entrepreneurs to help them evolve to the next level. This was my second struggle. When I was struggling in the early days I went to many banks but no banks agreed to give a loan to this industry. There was a political crisis in 2014. We had to endure some financial challenges. At that time there were a few projects that I needed to finance. Business declined in those six months and I had to get some financial assistance. The most interesting part is that the banks refused. But by that time I had a stable business and I myself reached a stable situation. Almost all the banks I approached said, Sir, if you want a loan for buying a car or a home, we can give you the loan but we can’t give you a loan in the advertising business. This is in 2014 when I already had 7-8 years of business and had a business profile and a story of reasonable success. If you run a small grocery shop, you could get a loan but for advertising, you can’t avail one. After that, I did a little bit of research for why banks don’t give a loan to ad business. After talking to a few of my friends in a few banks I came to know that our business is in the non-recommended category for loans. I felt insulted. Is our sector that bad that nobody would believe us? Finance is a huge thing for a new entrepreneur. Today it is not possible to start a business with 100 taka, that day is gone. It can’t happen practically. In order to succeed in entrepreneurship, you need to know what you really want to to do, research the business domain you want to work in, set clear goals, ensure that you have access to the needed finance. Before starting this business, I worked hard to learn every facet of the advertising business. I worked in every possible sector that could help me in building this business. Today, if someone wants to start a technology business, for instance, if you want to build an ecommerce, you have to understand not only ecommerce but also how to build an organization as well. He or she has to understand the organizational dynamics of building a business. Has to understand where the money would come from. You have to figure these things out while building a business. When I’m building a company, I need good people, I need to market my product and service – I have to understand marketing, I need to have management skills, I need to know finance management. An entrepreneur has to start with having a proper understanding of all these things otherwise heartbreak will be only feasible end-result. In my case, these three challenges were big enough for me: finance, family struggle when my family went through a financial challenge and not knowing what to do due to lack of guidance and mentorship. I’m a very optimistic person. If you see my story, you would see that I always tried to go for something above me, something that seemed impossible for me to achieve at that moment. But I went for it nevertheless. That’s the way I am. I think that mindset helps you to get through the troubled period and not give up. One of the difficult phases of your journey related to associating with a global agency partner was when the deal with TBWA didn’t convert despite the fact that TBWA wanted to work with you and team. How did you face it and get over it? Yes, it was quite a frustrating phase. TBWA was very excited to work with us and I was too. And we also had the first TBWA network client on board, Standard Chartered Bank. But where the progress got haywire was I had a partner back then and I was quite dependent on him on financial reasons as I was in my starting block. But neither he gave the importance the opportunity required nor did he react at the pace which was needed. So all in all, the opportunity went away to another agency. Post this bitter experience, I took one learning that if I have to make my agency dream happen, it has to be me, who has to drive it on my own with whatever I had whether financial or non-financial. So soon after, I went on my own and created MACOMM in 2005 with a vision to make it a local agency without any international alignments, which will be respected and taken note of by client and industry alike. Then 4 years later, I created our first global agency partnership in 2009 with Carat/Aegis Network with our second agency MediaAxis. The second phase would be when you are starting to build on your first three years. When you passed the first three years, you should have some success stories in these three years. Not big ones probably, small ones. Then you need to know how to maximize those milestones – how you could use those success stories to your advantage, use them as inspiration and start building on them. By building I mean you need to look for good people, you need to look for a little bigger opportunity but stay on course. How do you operate as a CEO? What does a typical day of you look like? First of all, I’m a workaholic. I wake as early as 7:00 am in the morning. I’m telling when I go to bed later (laugh). I prepare my son for school and my wife drops him at the school. We have divided the task; I don’t drop him at school but I prepare him. So I wake up at 7, prepare my son and then I go back to sleep and sleep for two more hours. Then I come to the office. I’m not an early starter. I usually come to the office at around 11 am in the morning. That’s when my day starts. I stay at the office, on weekdays, until around 11 pm or even late sometime. Then I go back home. There is a reason for this. Till 7-8 pm in the evening, I stay very much engaged with the team, with work, with departments and companies. After 8-9 pm, it is my time. That’s my thinking and planning time. After going back home, I spend some time with my family and have my dinner followed by little TV browsing. My son usually sleeps early, so sometimes I miss him on weekdays. Otherwise, I have my conversation with my wife. Then they all go to sleep and I work some more. This is when I review the presentations of my team or prepare client presentations. My better half has played an instrumental role in sacrificing her career ambitions and looking after our son and manage home. When there is a big presentation, my team usually sends these to me, I go through these presentations during this period and give my feedback and value addition and I also night dream. By the time, I go to sleep is about 2 to 2:30. That’s how my life operates. I don’t work on Fridays. Fridays are for my family. On Saturdays, half I’m at home and rest half I come back to the office. On a daily basis, what does your to-do list look like? What are a few things that you do every day as the CEO? Each day is different and comes with different priorities, so it is hard to tell. However, there are some commonalities. I sit down with a different team different days, brand team one day and the creative team another day, and so on. I sit down with my finance team on a day to day basis at least for half-an-hour. In the recent time, I have been trying to delegate and let people do their things without me being involved. I have realized that in order to grow as a company you have to grow new leaders and you can’t grow leaders if you don’t delegate and give them responsibilities. This allows me to free up some time as well. I also take an out of office leadership training twice a year. I take people who do well in our appraisal process and take them to a leadership training session out of the office where I take a session on leadership for 2-3 hours on how to be an effective leader. Currently, we have 6-7 people who might be the leaders of our companies in the near future. We invest in these people. And I’m personally grooming them from their managerial positions. Then we have review sessions of each organization after every quarter. I don’t wait to year end to see where we have gone wrong or gone right. We do it quarterly so that we can make the correction within a short time span. Every quarter we have these quarterly meetings where we do this. What are the challenges for the company now? One challenge is managing growth. We have grown from 2-3 person team to around 70 now. We have grown to five companies and managing this growth is a challenge. One thing that I have noticed in our local companies is that when they become successful, qualities start to fall. One of the reasons this happens because the people who are behind the vision could no more take care of everything anymore. We have come to a point where this is going to happen to us as well if we don’t manage it well. In the last couple of years what happened is that we have gone from an agency that looks for clients to an agency that clients look for now. Clients now come to us and want to work with us. That’s a great feeling. We are getting the reward of our 12 years years of work. But at the same time, it is also giving me a challenge of managing more people. Getting more people on-board and aligning all of them with the organizational vision. Managing these new expansions and handling the growth of our existing operations, this is the biggest challenge at this moment for me as well as for us as an organization. What should be the role of a CEO when the company is small? And how should the role change as the company grows? When you just open shop, two things are important. First, you have to survive. By survive I mean you have to survive through failures, financial struggles, people not wanting to work with you, and rejections and many other challenges. And making sure no matter what, you stay on-course. These two things are for the first phase when you just started. Now you come to the third stage. Now you have grown to a significant level. If you want to grow further, expand further, three big challenges will come: managing your own time and energy, how well you decentralize, and the third thing is staying on course while also expanding that course. In the third phase, there is this little difference which is you need to expand your course as well. In the first two phases, you can’t expand course but in the third stage, you have to find new opportunities, geographies and territories and so on. I don’t like expanding into unchartered territories. As you grow as a business, many distractions and ideas come from all sides. Different people would give you different ideas. I listen to these ideas but I don’t take any action. Because I believe that I should not do something that I don’t understand. Bangladesh will be very different after 5-10 years in every way. For example, there are these economic zones coming up across the country. In the near future, secondary cities like Chittagong, Khulna and Sylhet and similar cities will become economically self-sustaining. It will create new businesses and help flourish them and large business will expand there and present new opportunities for advertising agencies to serve these companies regionally. So that’s an opportunity. So this is one goal of expansion that we have. Then I have plans to expand to Nepal and Singapore. Since I have a relationship with Singapore for a long time, we want to expand there. We want to start operation in the near future. We want to be proactive that we have been for a long time. There are three hubs in this region: Singapore, Dubai, and Mumbai. All the big companies operate out of these hubs. If you are proactive you will find ways to engage new incoming brands before others. Apart from expanding the current business segments, there are a few interesting areas that I’m looking at. One is creating new businesses. I want to explore creating some in-house brands. We have been building brands for many years and now we want to build a few of our brands. That far I can tell you now. I’m looking at a unique jute products business. This is with one of my colleagues at MACOMM, a senior person. We are exploring the ideas and we may have something here in the future. It may happen or not happen. But worth a think and a try. When people in our organizations come up with business ideas, I support them. Although this is a counterintuitive idea, I think since I’m an entrepreneur, I should support others who have ambitions to pursue their own dreams. That’s to some extent staying true to myself.